I’ve been thinking for a while about leaving Dhakeilh’s guild. Not that they aren’t nice enough people, but the time zones aren’t a particularly good match, and even when they’re on, for some reason they seem to have difficulty hearing anything I say – because they never, never answer. This has got to the point where I almost wonder whether my gchat channel is even working! As I said, not unpleasant people – but also not a very social environment, and since I can’t raid easily on that server due to time zone issues, I’m really looking for a nice friendly guild. On the other hand, they have put up with me as I leveled to 80, and it seemed a little cheeky to ding 80 and immediately say ‘Bye! Looking for someone I like better.’ So I dithered, and mumbled, and complained to other friends, and finally started looking around for a social guild to join. My efforts were somewhat complicated, however, by my criteria: the members must behave in a reasonably mature fashion, must at least attempt to speak English and not l33t, and must enjoy doing things together. You wouldn’t think it would be all that hard to find, but somehow, one or other of those criteria has been missing from all the ones I’d so far looked into – and with Cataclysm around the corner, I want my efforts to go into leveling a guild I actually like. Then, as it is wont to do, serendipity came along. 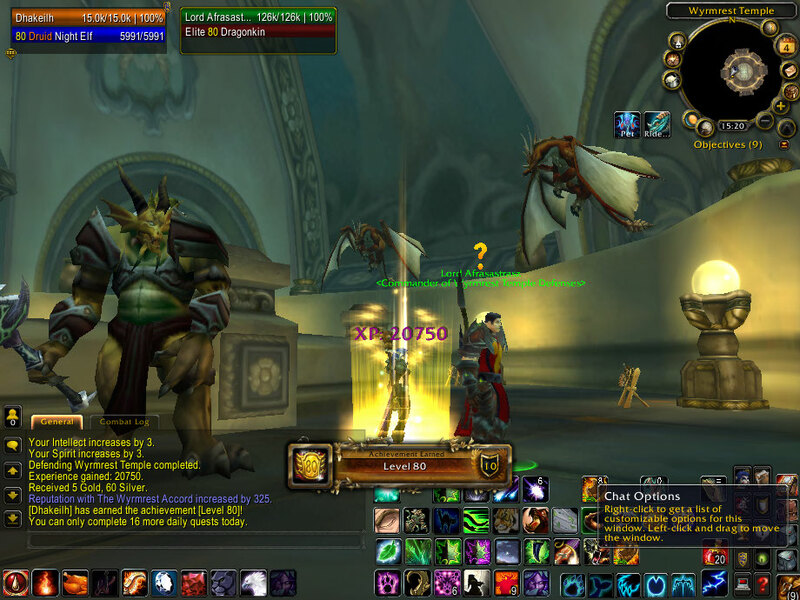 I had temporarily given up the quests both for a new guild and for Sons of Hodir reputation and had gone off to mess around on a level 10 priest – and got recruited into a leveling guild. Not only did the recruiter appear to have a basic command of the English language (though it isn’t his first), he also showed distinct signs of intelligence – and he wasn’t the only guild member logged in at the time, although it was the morning. What can I lose, I thought – it’s only a level 10, I can always leave if I don’t like them. So I signed up, got a few levels, chatted to them on teamspeak and was reasonably content with life. Then, the next morning, I logged onto Dhakeilh and found a letter from my old GM. Apparently the guild had quietly disbanded itself overnight, and since I had been a ‘long term and loyal’ member, he’d done me the courtesy of writing to tell me. Timing, as they say, is everything; rather than floundering, I simply wrote him a ‘thanks and good luck’ note, and got Dhakeilh into this new guild with my little priest. They were thankful to have another 80, and I am interested to experience WoW with other people, instead of just with other people talking in their little groups, so it appears to be a win/win situation so far. They seem to like voice chatting whenever more than one person is on, which tends to make me retreat into my shell a bit, but it is nice to have found a group that not only talks to one another but (*gasp*) plays WoW with one another! Maybe it’s something about being a fresh 80, which I’ll admit is written all over me even just to look at, but yesterday I attracted not one but two overly helpful citizens on my way to obtain my swift flight form. This, by the way, is a milestone, since achieving that much money has taken me quite a while; clearly I don’t spend enough time playing the auction house. It must be admitted that taking unsolicited advice has never been my strong point. I prefer to ask for help when I want it and otherwise stand on my own feet, which has its good and bad points; it certainly led to my amusing demise yesterday in my first ever Trial of the Crusader run, when I got confused about where we were supposed to be standing and wandered over to the champions of the Horde…without bothering about any little details like, for instance, the tank or the healer. Fortunately in that case my group were more entertained than annoyed, and I got a quick resurrection and we finished the rest without a hitch. I then toddled off to spend almost all my money on buying artisan riding and my swift flight form and a new gryphon (not that I don’t love my snowy one…and not that I need a new mount, you know, with the whole bird thing going on). It was when I hit Valiance Keep and the trainer that the fun began. First up was a level 23 night elf, riding his first ever tiger, who wanted to know whether I knew how to fly. Upon being informed that yes, as a level 80 druid, I could in fact fly, he then wanted to know if I had a gryphon and if it could walk. (Because, you know, we buy gryphons for their l33t walking capabilities). Having enjoyed a demonstration of the ambulatory talents of a snowy gryphon, he stood and watched as I bought the flight skill and got the relevant achievement…and then congratulated me and suggested that I might want to get swift flight form or a faster mount, because the bird he’d seen me fly in as was slow. Thank you for those wise words, my friend. What did you think I’m doing? He took himself off back to Darkshore, running commentary all the way, and I headed up to the roof of the keep to get my random-mount-calling macro right so that it stopped insisting that I wanted to use a slower mount. On the way I met a level 70 whose very first words were…wait for it…’Why is your gs so low, lulz’. OK, answering may have been feeding the trolls, but I did it anyway – along the lines of ‘fresh 80. And it’s your business because…?’ It turned out, however, that he had my best interests at heart all along; he wanted to tell me that to get into ICC runs I would need a higher gearscore and some achievements. I suppose he felt he was being helpful (or at least was labouring under the delusion that flying around Valiance Keep means someone has immediate plans to go to ICC), but I fail to see why a fresh 80 with a gearscore of 2.4k would be trying to get into ICC runs at all! The phrase ‘squashed like a gnat’ comes to mind. One of my favourite sayings has always been ‘Better to keep silent and be thought a fool than to speak and remove all doubt.’ The fact of this blog’s existence, of course, demonstrates that I don’t actually follow that wise counsel – but my two benefactors today have certainly proven to me that giving advice should only be undertaken if you’re absolutely sure of your ground, just in case there was any confusion on that score! Meanwhile, I shall continue to potter around on my own little agenda…and use the /ignore command freely. How do you usually handle the unwanted but oh, so helpful suggestions you encounter? Any creative strategies beyond pretending they’re not there? Getting your first 80 has to be a pretty momentous thing. At least, for me, I have to say I’m excited about it – even though pretty soon 80 will no longer be the level cap and Dhakeilh will once again be a candidate for leveling! I even had the way I’d finally get there planned out, and I’m happy to say that a plan for once went exactly as intended. 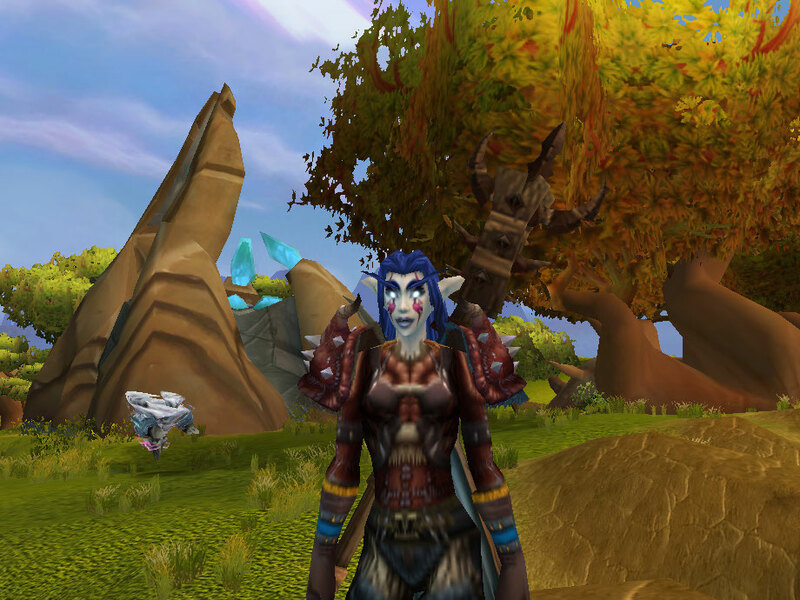 At heart, I am basically someone who enjoys traditions and routines, so it made sense to go back to the first ‘grown up’ quest I ever did in WoW. It was not, of course, on my account; a friend in the US who I was visiting was attempting to convert me and, knowing me well, took his character to Dragonblight. Needless to say, I was abysmally bad at the quest, which was the one involving fighting the Azure Dragonflight at the temple, and I have a nasty feeling I may have created something of a repair bill for him – but the experience of flying a-dragonback, exactly as he planned, created a memory that stuck. I put off starting to play on my own for about a year after that, but the dragons can take the credit for putting out the initial bait – and so I went back to them as the very last quest to get me over the line to 80. In a way, it was a little anticlimactic – no fanfare, just the completion of another daily quest. It is, however, quite satisfying in a quiet sort of way – and this even though I realise that this is only the very beginning of Dhakeilh’s adventures. As a matter of fact, I’m currently working on Valiance Expedition reputation, so there will be no resting on laurels around here. Also, I need to go through and make a list of the gear I need from the normal dungeons, and begin the (from all I hear) endless cycle of replacing existing equipment with better. Fortunately, being a jewelcrafter, one aspect of that at least will be cheaper and easier. A million things to do notwithstanding, though, reaching 80 is still a milestone – and I intend to enjoy it. I also expect to have nearly as much fun picking out a new character to level…but that’s a story for another time! Welcome to Eight Paws! This blog is very much about sharing what I learn as I level and then continue to play my main characters, Dhakeilh and Aminyara, so I thought a good starting point would be to meet some of the stars of the show. Dhakeilh has the dubious honour of being my first character to even approach maximum level, being currently in the low 70s but climbing steadily. She is a feral druid with a rather strangely hybrid bear/cat spec that has evolved over time; I initially wanted her to be a tank, and that is still the ultimate plan, but in the meantime leveling was far easier as a kittycat (and Tiganza thought cat form was more appropriate), so I picked up some dps talents as well. Being a coward, I am too nervous to group for dungeons as a tank until I have some idea of what I’m doing, so she currently spends most of her time as a cat with very mediocre damage while I learn the basics of bear tanking on a baby druid alt. Contrary to appearances here, not all or even most of my characters are of the elvish persuasion. 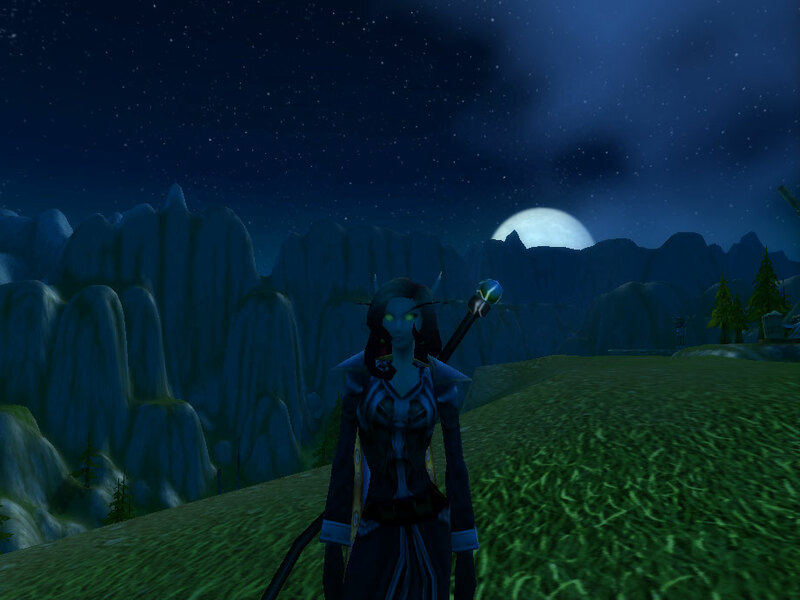 That said, I must admit Aminyara is indeed a blood elf – a fire mage currently in her low 30s. She is a member of a regiment called Sons of Victory on the Wyrmrest Accord RP server, and is played essentially constantly in character. This gives a wholly different experience to playing normal PvE (something I also love; Dhakeilh has no trace of roleplay about her!) and often creates a very fresh and interesting perspective. I intend to post regularly about Dhakeilh and Aminyara both, as the ‘backbone’ of this blog. One of them is approaching endgame content and the other is involved in the roleplay scene – two utterly different aspects of Wow that both draw me in. On the way, no doubt I’ll learn a lot…and hopefully if anyone reads this, it will be at least mildly interesting!